"The Battle of Endor" redirects here. For the television film, see Ewoks: The Battle for Endor. For other uses, see Return of the Jedi (disambiguation). Return of the Jedi (also known as Star Wars: Episode VI – Return of the Jedi) is a 1983 American epic space-opera film directed by Richard Marquand. The screenplay is by Lawrence Kasdan and George Lucas from a story by Lucas, who was also the executive producer. It is the third installment in the original Star Wars trilogy, set one year after The Empire Strikes Back. The film stars Mark Hamill, Harrison Ford, Carrie Fisher, Billy Dee Williams, Anthony Daniels, David Prowse, Kenny Baker, Peter Mayhew and Frank Oz. In the film, the Galactic Empire, under the direction of the ruthless Emperor, is constructing a second Death Star in order to crush the Rebel Alliance once and for all. Since the Emperor plans to personally oversee the final stages of its construction, the Rebel Fleet launches a full-scale attack on the Death Star in order to prevent its completion and kill the Emperor, effectively bringing an end to his hold over the galaxy. Meanwhile, Luke Skywalker struggles to bring his father Darth Vader back to the light side of the Force. David Lynch and David Cronenberg were considered to direct the project before Marquand signed on as director. The production team relied on Lucas' storyboards during pre-production. While writing the shooting script, Lucas, Kasdan, Marquand, and producer Howard Kazanjian spent two weeks in conference discussing ideas to construct it. Kazanjian's schedule pushed shooting to begin a few weeks early to allow Industrial Light & Magic more time to work on the film's effects in post-production. Filming took place in England, California, and Arizona from January to May 1982 (1982-05). Strict secrecy surrounded the production. The film was released in theaters on May 25, 1983, six years to the day after the release of the first film, receiving mostly positive reviews. The film grossed between $475 million and $572 million worldwide. Several rereleases and revisions to the film followed over the next three decades. 16 years after its original release, it was followed by a prequel trilogy, and 32 years later, a sequel trilogy. In an attempt to rescue Han Solo from crimelord Jabba the Hutt, C-3PO and R2-D2 are sent to Jabba's palace on Tatooine in a trade bargain made by Luke Skywalker. Disguised as a bounty hunter, Princess Leia infiltrates the palace under the pretense of collecting the bounty on Chewbacca and unfreezes Han, but is caught and enslaved. Luke arrives soon afterward, but after a tense standoff, is sent through a trapdoor to do battle with Jabba's rancor. Jabba sentences Luke and Han to death by being fed to the Sarlacc. Having hidden his lightsaber inside R2-D2, Luke frees himself and battles Jabba's guards while Leia uses her chains to strangle Jabba. As the others rendezvous with the Rebel Alliance, Luke returns to Dagobah, where he finds that Yoda is dying. Yoda confirms that Darth Vader, once known as Anakin Skywalker, is Luke's father. The Force ghost of Obi-Wan Kenobi reveals that Leia is Luke's twin sister. The Jedi Masters tell Luke that he must face Vader again to defeat the Empire and become a Jedi Knight. As Yoda disappears, he becomes one with the Force. The Rebel Alliance learns that the Empire has been constructing a new Death Star under the supervision of the Emperor himself. As the station is protected by an energy shield, Han leads a strike team to destroy the shield generator on the forest moon of Endor; doing so would allow a squadron of starfighters to destroy the Death Star. Luke and Leia accompany the strike team to Endor in a stolen Imperial shuttle. Luke and his companions encounter a tribe of Ewoks and, after an initial conflict, gain their trust. Later, Luke tells Leia that she is his sister, Vader is their father, and that he must confront him. Surrendering to Imperial troops, Luke is brought before Vader, and he tries to convince his father to return from the dark side of the Force. Vader takes Luke to the Death Star to meet the Emperor, intent on turning him to the dark side. The Emperor reveals that the Death Star is operational and that the Rebel Fleet will fall into a trap. On Endor, Han's team is captured by Imperial forces, but a counterattack by the Ewoks allows the Rebels to infiltrate the shield generator. Meanwhile, Lando Calrissian leads the Rebel Fleet in the Millennium Falcon, only to find that the Death Star's shield is still active, and the Imperial fleet waiting for them. The Emperor tempts Luke to give in to his anger, and Luke engages Vader in a lightsaber duel. Vader senses that Luke has a sister, and threatens to turn her to the dark side. Enraged, Luke attacks and severs Vader's prosthetic hand. The Emperor entreats Luke to kill Vader and take his place, but Luke refuses, declaring himself a Jedi as his father had been. Furious, the Emperor tortures Luke with Force lightning. Unwilling to let his son die, Vader throws the Emperor down a pit, but is mortally electrocuted in the process. At his last request, Luke removes the redeemed Anakin's mask before he dies in Luke's arms. After the strike team destroys the shield generator, Lando leads a group of Rebel fighters into the Death Star core and destroys its main reactor. As the Falcon flies out of the Death Star's superstructure and Luke escapes on a shuttle with his father's body, the station explodes. On Endor, Leia reveals to Han that Luke is her brother, and they kiss. Luke cremates Anakin's body on a pyre. As the defeat of the Empire is celebrated, Luke sees the spirits of Yoda, Obi-Wan, and Anakin watching over him. Kenny Baker as R2-D2: An astromech droid, friend of Luke, and longtime companion of C-3PO. He also portrays a GONK power droid in the background. Frank Oz as Yoda: The wise, centuries-old Jedi Master, who lives on Dagobah and trained Luke. After dying, he reappears to Luke as a Force ghost. Sebastian Shaw as Anakin Skywalker: After defeating the Emperor, Vader asks Luke to take off his mask so he can see his son clearly before he dies. Originally, Shaw also appeared as Anakin's Force ghost. Hayden Christensen as Anakin's Force ghost: In the 2004 DVD release of the original trilogy, the actor who portrayed Anakin in the second and third prequel films replaces Shaw as the character's Force ghost; this change was intended to bring Return of the Jedi into continuity with the larger saga. Denis Lawson reprises his role as Wedge Antilles from Star Wars, and Kenneth Colley and Jeremy Bulloch reprise their roles as Admiral Piett and Boba Fett from The Empire Strikes Back. Michael Pennington portrays Moff Jerjerrod, the commander of the second Death Star. Warwick Davis appears as Wicket W. Warrick, an Ewok who leads Leia and eventually her friends to the Ewok tribe. Baker was originally cast as Wicket, but was replaced by Davis after falling ill with food poisoning on the morning of the shoot. Davis had no previous acting experience and was cast only after his grandmother had discovered an open call for dwarfs for the new Star Wars film. Caroline Blakiston portrays Mon Mothma, a co-founder and leader of the Rebel Alliance. Michael Carter played Jabba's aide, Bib Fortuna (voiced by Erik Bauersfeld), while Femi Taylor and Claire Davenport appeared as Jabba's original slave dancers. To portray the numerous alien species featured in the film a multitude of puppeteers, voice actors, and stunt performers were employed. Admiral Ackbar was performed by puppeteer Timothy M. Rose, with his voice provided by Erik Bauersfeld. Nien Nunb was portrayed by Richard Bonehill in costume for full body shots, while he was otherwise a puppet operated by Mike Quinn and his voice was provided by Kipsang Rotich. Rose also operated Salacious Crumb, whose voice was provided by Mark Dodson. Quinn also played Ree-Yees and Wol Cabbashite. Sy Snootles was a marionette operated by Rose and Quinn, while her voice was provided by Annie Arbogast. Others included Simon J. Williamson as Max Rebo, a Gamorrean Guard and a Mon Calamari; Deep Roy as Droopy McCool; Ailsa Berk as Amanaman; Paul Springer as Ree-Yees, Gamorrean Guard and a Mon Calamari; Hugh Spight as a Gamorrean Guard, Elom and a Mon Calamari; Swee Lim as Attark the Hoover; Richard Robinson as a Yuzzum; Gerald Home as Tessek and the Mon Calamari officer; Phil Herbert as Hermi Odle; Tik and Tok (Tim Dry and Sean Crawford) as Whiphid and Yak-Face; Phil Tippett as the Rancor with Michael McCormick. Jabba the Hutt was operated by Toby Philpott, David Barclay and Mike Edmonds (who also portrays the Ewok Logray) operated the tail. Larry Ward portrays the Huttese language voice with Mike Quinn, among other roles, controlling the eyes. As with the previous film, Lucas personally financed Return of the Jedi. Lucas also chose not to direct Return of the Jedi himself, and started searching for a director. Although Lucas' first choice was Steven Spielberg, their separate feuds with the Director's Guild led to his being banned from directing the film. Lucas approached David Lynch, who had been nominated for the Academy Award for Best Director for The Elephant Man in 1980, to helm Return of the Jedi, but Lynch declined in order to direct Dune. David Cronenberg was also offered the chance to direct, but he declined the offer to make Videodrome and The Dead Zone. Lamont Johnson, director of Spacehunter: Adventures in the Forbidden Zone, was also considered. Lucas eventually chose Richard Marquand. Lucas may have directed some of the second unit work personally as the shooting threatened to go over schedule; this is a function Lucas had willingly performed on previous occasions when he had only officially been producing a film (e.g. More American Graffiti, Raiders of the Lost Ark). Lucas did operate the B camera on the set a few times. Lucas himself has admitted to being on the set frequently because of Marquand's relative inexperience with special effects. Lucas praised Marquand as a "very nice person who worked well with actors". Marquand did note that Lucas kept a conspicuous presence on set, joking, "It is rather like trying to direct King Lear – with Shakespeare in the next room!" The screenplay was written by Lawrence Kasdan and Lucas (with uncredited contributions by David Peoples and Marquand), based on Lucas' story. Kasdan claims he told Lucas that Return of the Jedi was "a weak title", and Lucas later decided to name the film Revenge of the Jedi. The screenplay itself was not finished until rather late in pre-production, well after a production schedule and budget had been created by Kazanjian and Marquand had been hired, which was unusual for a film. Instead, the production team relied on Lucas' story and rough draft in order to commence work with the art department. When it came time to formally write a shooting script, Lucas, Kasdan, Marquand and Kazanjian spent two weeks in conference discussing ideas; Kasdan used tape transcripts of these meetings to then construct the script. I played a very important part in bringing Harrison back for Return of the Jedi. Harrison, unlike Carrie Fisher and Mark Hamill signed only a two picture contract. That is why he was frozen in carbonite in The Empire Strikes Back. When I suggested to George we should bring him back, I distinctly remember him saying that Harrison would never return. I said what if I convinced him to return. George simply replied that we would then write him in to Jedi. I had just recently negotiated his deal for Raiders of the Lost Ark with Phil Gersh of the Gersh Agency. I called Phil who said he would speak with Harrison. When I called back again, Phil was on vacation. David, his son, took the call and we negotiated Harrison's deal. When Phil returned to the office several weeks later he called me back and said I had taken advantage of his son in the negotiations. I had not. But agents are agents. Ford suggested that Han Solo be killed through self-sacrifice. Kasdan concurred, saying it should happen near the beginning of the film to instill doubt as to whether the others would survive, but Lucas was vehemently against it and rejected the concept. Gary Kurtz, who produced Star Wars and The Empire Strikes Back but was replaced as producer for Return of the Jedi by Kazanjian, said in 2010 that the ongoing success with Star Wars merchandise and toys led George Lucas to reject the idea of killing off Han Solo in the middle part of the film during a raid on an Imperial base. Luke Skywalker was also to have walked off alone and exhausted like the hero in a Spaghetti Western but, according to Kurtz, Lucas opted for a happier ending to encourage higher merchandise sales. Yoda was originally not meant to appear in the film, but Marquand strongly felt that returning to Dagobah was essential to resolve the dilemma raised by the previous film. The inclusion led Lucas to insert a scene in which Yoda confirms that Darth Vader is Luke's father because, after a discussion with a children's psychologist, he did not want younger moviegoers to dismiss Vader's claim as a lie. Many ideas from the original script were left out or changed. For instance, the Ewoks were going to be Wookiees, the Millennium Falcon would be used in the arrival at the forest moon of Endor, and Obi-Wan Kenobi would return to life from his spectral existence in the Force. The heavy forest of Redwood National Park was used to film the forests of Endor in Return of the Jedi. Filming began on January 11, 1982, and lasted through May 20, 1982, a schedule six weeks shorter than The Empire Strikes Back. Kazanjian's schedule pushed shooting as early as possible in order to give Industrial Light & Magic (ILM) as much time as possible to work on effects, and left some crew members dubious of their ability to be fully prepared for the shoot. Working on a budget of $32.5 million, Lucas was determined to avoid going over budget as had happened with The Empire Strikes Back. Producer Howard Kazanjian estimated that using ILM (owned wholly by Lucasfilm) for special effects saved the production approximately $18 million. However, the fact that Lucasfilm was a non-union company made acquiring shooting locations more difficult and more expensive, even though Star Wars and The Empire Strikes Back had been big hits. The project was given the working title Blue Harvest with a tagline of "Horror Beyond Imagination." This disguised what the production crew was really filming from fans and the press, and also prevented price gouging by service providers. The first stage of production started with 78 days at Elstree Studios in England, where the film occupied all nine stages. The shoot commenced with a scene later deleted from the finished film where the heroes get caught in a sandstorm as they leave Tatooine. (This was the only major sequence cut from the film during editing.) While attempting to film Luke Skywalker's battle with the rancor beast, Lucas insisted on trying to create the scene in the same style as Toho's Godzilla films by using a stunt performer inside a suit. The production team made several attempts, but were unable to create an adequate result. Lucas eventually relented and decided to film the rancor as a high-speed puppet. In April, the crew moved to the Yuma Desert in Arizona for two weeks of Tatooine exteriors. Production then moved to the redwood forests of northern California near Crescent City where two weeks were spent shooting the Endor forest exteriors, and then concluded at ILM in San Rafael, California for about ten days of bluescreen shots. One of two "skeletal" post-production units shooting background matte plates spent a day in Death Valley. The other was a special Steadicam unit shooting forest backgrounds from June 15–17, 1982, for the speeder chase near the middle of the film. Steadicam inventor Garrett Brown personally operated these shots as he walked through a disguised path inside the forest shooting at less than one frame per second. By walking at about 5 mph (8 km/h) and projecting the footage at 24 frame/s, the motion seen in the film appeared as if it were moving at around 120 mph (190 km/h). John Williams composed and conducted the film's musical score with performances by the London Symphony Orchestra. Orchestration credits also include Thomas Newman. The initial release of the film's soundtrack was on the RSO Records label in the United States. Sony Classical Records acquired the rights to the classic trilogy scores in 2004 after gaining the rights to release the second trilogy soundtracks (The Phantom Menace and Attack of the Clones). In the same year, Sony Classical re-pressed the 1997 RCA Victor release of Return of the Jedi along with the other two films in the trilogy. The set was released with the new artwork mirroring the first DVD release of the film. Despite the Sony digital re-mastering, which minimally improved the sound heard only on high-end stereos, this 2004 release is essentially the same as the 1997 RCA Victor release. Meanwhile, special effects work at ILM quickly stretched the company to its operational limits. While the R&D work and experience gained from the previous two films in the trilogy allowed for increased efficiency, this was offset by the desire to have the closing film raise the bar set by each of these films. A compounding factor was the intention of several departments of ILM to either take on other film work or decrease staff during slow cycles. Instead, as soon as production began, the entire company found it necessary to remain running 20 hours a day on six-day weeks in order to meet their goals by April 1, 1983. Of about 900 special effects shots, all VistaVision optical effects remained in-house, since ILM was the only company capable of using the format, while about 400 4-perf opticals were subcontracted to outside effects houses. Progress on the opticals was severely delayed for a time when ILM rejected about 100,000 feet (30,000 m) of film when the film perforations failed image registration and steadiness tests. Return of the Jedi's theatrical release took place on May 25, 1983. It was originally slated to be May 27, but was subsequently changed to coincide with the date of the 1977 release of the original Star Wars film. With a massive worldwide marketing campaign, illustrator Tim Reamer created the image for the movie poster and other advertising. At the time of its release, the film was advertised on posters and merchandise as simply Star Wars: Return of the Jedi, despite its on-screen "Episode VI" distinction. The original film was later re-released to theaters in 1985. In 1997, for the 20th anniversary of the release of Star Wars (retitled Episode IV: A New Hope), Lucas released the Star Wars Trilogy: Special Edition. Along with the two other films in the original trilogy, Return of the Jedi was re-released on March 14, 1997, with a number of changes and additions, which included the insertion of several alien band members and a different song in Jabba's throne room, the modification of the Sarlacc to include a beak, the replacement of music at the closing scene, and a montage of different alien worlds celebrating the fall of the Empire. The original teaser trailer for the film carried the name Revenge of the Jedi. In December 1982, Lucas decided that "Revenge" was not appropriate as Jedi should not seek revenge and returned to his original title. By that time thousands of "Revenge" teaser posters (with artwork by Drew Struzan) had been printed and distributed. Lucasfilm stopped the shipping of the posters and sold the remaining stock of 6,800 posters to Star Wars fan club members for $9.50. Star Wars: Episode III – Revenge of the Sith, released in 2005 as part of the prequel trilogy, later alluded to the dismissed title Revenge of the Jedi. 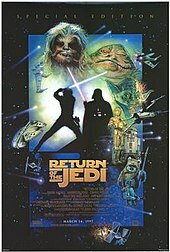 The original theatrical version of Return of the Jedi was released on VHS and Laserdisc several times between 1986 and 1995, followed by releases of the Special Edition in the same formats between 1997 and 2000. Some of these releases contained featurettes; some were individual releases of just this film, while others were boxed sets of all three original films. On September 21, 2004, all three original films were released in a boxed set on DVD with additional changes made by George Lucas. The films were digitally restored and remastered, and the DVD also featured English subtitles, Dolby Digital 5.1 EX surround sound, and commentaries by George Lucas, Ben Burtt, Dennis Muren, and Carrie Fisher. The bonus disc included documentaries including Empire of Dreams: The Story of the Star Wars Trilogy and several featurettes including "The Characters of Star Wars", "The Birth of the Lightsaber", and "The Legacy of Star Wars". Also included were teasers, trailers, TV spots, still galleries, and a demo for Star Wars: Battlefront. With the release of Episode III: Revenge of the Sith, which depicts how and why Anakin Skywalker turned to the dark side of the Force, Lucas once again altered Return of the Jedi to bolster the relationship between the original trilogy and the prequel trilogy. The original and 1997 Special Edition versions of Return of the Jedi featured British theatre actor Sebastian Shaw playing both the dying Anakin Skywalker and his ghost. In the 2004 DVD, Shaw's portrayal of Anakin's ghost is replaced by Hayden Christensen, who portrayed Anakin in Attack of the Clones and Revenge of the Sith. All three films in the original unaltered Star Wars trilogy were later released, individually, on DVD on September 12, 2006. These versions were originally slated to only be available until December 31, 2006, although they remained in print until May 2011 and were packaged with the 2004 versions again in a new box set on November 4, 2008. Although the 2004 versions in these sets each feature an audio commentary, no other extra special features were included to commemorate the original cuts. The runtime of the 1997 Special Edition of the film and all subsequent releases is approximately five minutes longer than the original theatrical version. A Blu-ray Disc version of the Star Wars saga was announced for release in 2011 during Star Wars Celebration V. Several deleted scenes from Return of the Jedi were included for the Blu-ray version, including a sandstorm sequence following the Battle at the Sarlacc Pit, a scene featuring Moff Jerjerrod and Death Star officers during the Battle of Endor, and a scene where Darth Vader communicates with Luke via the Force as Skywalker is assembling his new lightsaber before he infiltrates Jabba's palace. On January 6, 2011, 20th Century Fox Home Entertainment announced the Blu-ray release for September 2011 in three different editions and the cover art was unveiled in May. On April 7, 2015, Walt Disney Studios, 20th Century Fox, and Lucasfilm jointly announced the digital releases of the six released Star Wars films. Walt Disney Studios Home Entertainment released Return of the Jedi through the iTunes Store, Amazon Video, Vudu, Google Play, and Disney Movies Anywhere on April 10, 2015. 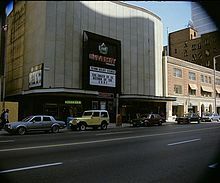 Return of the Jedi showing at the University Theatre in Toronto; the marquee reads, "The Smash of 83"
Depending on sources, Return of the Jedi grossed between $475 million and $572 million worldwide. Box Office Mojo estimates that the film sold over 80 million tickets in the US in its initial theatrical run. According to the review aggregator website Rotten Tomatoes, 81% of critics have given the film a positive review with an average rating of 7.2/10, based on 89 reviews from critics. Its critics consensus states, "Though failing to reach the cinematic heights of its predecessors, Return of the Jedi remains an entertaining sci-fi adventure and a fitting end to the classic trilogy." At Metacritic, the film received a score of 58 out of 100 based on 24 reviews from mainstream critics, indicating "mixed or average reviews". Contemporary critics were largely positive. In 1983, film critic Roger Ebert gave the film four stars out of four, and James Kendrick of Q Network Film Desk described Return of the Jedi as "a magnificent experience." The film was also featured on the May 23, 1983, TIME magazine cover issue (where it was labeled "Star Wars III"), where the reviewer Gerald Clarke said that while it was not as exciting as the first Star Wars film, it was "better and more satisfying" than The Empire Strikes Back, now considered by many as the best of the original trilogy. Vincent Canby of The New York Times called it "by far the dimmest adventure of the lot". Although it was great fun re-watching Star Wars and The Empire Strikes Back again on the big screen, Return of the Jedi doesn't generate the same sense of enjoyment. And, while Lucas worked diligently to re-invigorate each entry into the trilogy, Jedi needs more than the patches of improved sound, cleaned-up visuals, and a few new scenes. Still, despite the flaws, this is still Star Wars, and, as such, represents a couple of lightly-entertaining hours spent with characters we have gotten to know and love over the years. Return of the Jedi is easily the weakest of the series, but its position as the conclusion makes it a must-see for anyone who has enjoyed its predecessor. While the action set pieces – particularly the Sarlacc battle sequence, the speeder bike chase on the Endor moon, the space battle between Rebel and Imperial pilots, and Luke Skywalker's duel against Darth Vader – are well-regarded, the ground battle between the Ewoks and Imperial stormtroopers remains a bone of contention. Fans are also divided on the likelihood of Ewoks (being an extremely primitive race of small creatures armed with sticks and rocks) defeating an armed ground force comprising the Empire's "best troops". Lucas has defended the scenario, saying that the Ewoks' purpose was to distract the Imperial troops and that the Ewoks did not really win. His inspiration for the Ewoks' victory came from the Vietnam War, where the indigenous Vietcong forces prevailed against the technologically superior United States. At the 56th Academy Awards in 1984, Richard Edlund, Dennis Muren, Ken Ralston, and Phil Tippett received the "Special Achievement Award for Visual Effects." Norman Reynolds, Fred Hole, James L. Schoppe, and Michael Ford were nominated for "Best Art Direction/Set Decoration". Ben Burtt received a nomination for "Best Sound Effects Editing". John Williams received the nomination for "Best Music, Original Score". Burtt, Gary Summers, Randy Thom and Tony Dawe all received the nominations for "Best Sound". At the 1984 BAFTA Awards, Edlund, Muren, Ralston, and Kit West won for "Best Special Visual Effects". Tippett and Stuart Freeborn were also nominated for "Best Makeup". Reynolds received a nomination for "Best Production Design/Art Direction". Burtt, Dawe, and Summers also received nominations for "Best Sound". Williams was also nominated "Best Album of Original Score Written for a Motion Picture or Television Special". The film also won for "Best Dramatic Presentation", the older award for science fiction and fantasy in film, at the 1984 Hugo Awards. 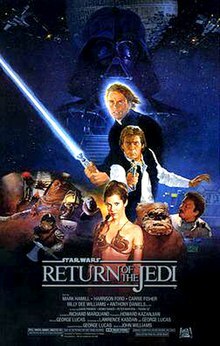 The novelization of Return of the Jedi was written by James Kahn and was released on May 12, 1983, thirteen days before the film's release. A radio drama adaptation of the film was written by Brian Daley with additional material contributed by John Whitman and was produced for and broadcast on National Public Radio in 1996. It was based on characters and situations created by George Lucas and on the screenplay by Lawrence Kasdan and George Lucas. 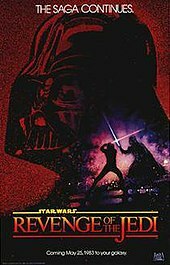 The first two Star Wars films were similarly adapted for National Public Radio in the early 1980s, but it was not until 1996 that a radio version of Return of the Jedi was heard. Anthony Daniels returned as C-3PO, but Mark Hamill and Billy Dee Williams did not reprise their roles as they had for the first two radio dramas. They were replaced by newcomer Joshua Fardon as Luke Skywalker and character actor Arye Gross as Lando Calrissian. John Lithgow voiced Yoda, whose voice actor in the films has always been Frank Oz. Bernard Behrens returned as Obi-Wan Kenobi and Brock Peters reprised his role as Darth Vader. Veteran character actor Ed Begley, Jr. played Boba Fett. Edward Asner also guest-starred speaking only in grunts as the voice of Jabba the Hutt. The radio drama had a running time of three hours. Principal production of the show was completed on February 11, 1996. Only hours after celebrating its completion with the cast and crew of the show, Daley died of pancreatic cancer. The show is dedicated to his memory. The cast and crew recorded a get-well message for Daley, but the author never got the chance to hear it. The message is included as part of the Star Wars Trilogy collector's edition box set. Marvel Comics published a comic book adaptation of the film by writer Archie Goodwin and artists Al Williamson, Carlos Garzon, Tom Palmer, and Ron Frenz. The adaptation appeared in Marvel Super Special #27 and as a four-issue limited series. It was later reprinted in a mass market paperback. Lucasfilm adapted the story for a children's book-and-record set. Released in 1983, the 24-page Star Wars: Return of the Jedi read-along book was accompanied by a 33⅓ rpm 7-inch (18 cm) gramophone record. Each page of the book contained a cropped frame from the film with an abridged and condensed version of the story. The record was produced by Buena Vista Records. ^ "STAR WARS EPISODE VI: RETURN OF THE JEDI (U)". British Board of Film Classification. May 12, 1983. Retrieved May 4, 2015. ^ a b c "Return of the Jedi". Box Office Mojo. IMDB. 2006. Retrieved July 30, 2006. ^ a b c "Return of the Jedi". BoxOffice. Retrieved April 27, 2016. ^ a b c "Return of the Jedi". The Numbers. Nash Information Services. 2015. Retrieved June 1, 2015. ^ "Star Wars: Episode VI Return of the Jedi". Lucasfilm. Archived from the original on February 12, 2010. Retrieved March 4, 2010. ^ Hughes, Mark (January 6, 2017). "'Star Wars' Jedi Force-Ghosts Appearing Young In Sequels Makes Perfect Sense". Forbes. Retrieved November 3, 2017. ^ Witzke, Sean (February 19, 2015). "A Look Back at Steven Spielberg at the Height of His Powers". Grantland. Retrieved October 8, 2018. ^ "David Lynch Meets George Lucas". YouTube. Retrieved December 1, 2014. ^ Ryan, Joal (May 24, 2013). "The 'Return of the Jedi' That Could Have Been". Yahoo!. Retrieved February 22, 2017. ^ Dale Pollock (1999). Skywalking: The Life and Films of George Lucas. Da Capo. ISBN 0-573-60606-4. ^ a b c Marcus Hearn (2005). "Cliffhanging". The Cinema of George Lucas. New York City: Harry N. Abrams Inc. pp. 140–1. ISBN 0-8109-4968-7. ^ a b c Richard Patterson (June 1983). "Return of the Jedi: Production and Direction, p. 3". American Cinematographer. Retrieved August 19, 2007. ^ Howard Kazanjian interview, ". ^ George Lucas (June 12, 1981). "Star Wars — Episode VI: "Revenge of the Jedi" Revised Rough Draft". Starkiller. Archived from the original on February 3, 2007. Retrieved February 22, 2007. ^ a b c d e Richard Patterson (June 1983). "Return of the Jedi: Production and Direction, p. 4". American Cinematographer. Retrieved August 19, 2007. ^ a b c d Richard Patterson (June 1983). "Return of the Jedi: Production and Direction, p. 1". American Cinematographer. Retrieved August 19, 2007. ^ Hesseltine, Cassandra. "Complete Filmography of Humboldt County". Humboldt Del Norte Film Commission. Humboldt Del Norte Film Commission. Retrieved October 12, 2017. ^ "Return of the Jedi: Steadicam Plates, p. 3". American Cinematographer. Retrieved August 19, 2007. ^ "When John Williams Can't Go, Whom Does Spielberg Call? Thomas Newman". NPR.org. October 17, 2015. ^ "Star Wars / The Empire Strikes Back / Return of the Jedi (Original Soundtracks – 2004 reissue)". Retrieved January 20, 2007. ^ "Return of the Jedi: Production and Direction, p. 2". American Cinematographer. Retrieved August 19, 2007. ^ "Episode VI: What Has Changed?". StarWars.com. September 8, 2006. Archived from the original on February 29, 2008. Retrieved March 10, 2008. ^ Sansweet & Vilmur (2004). The Star Wars Poster Book. Chronicle Books. p. 124. ^ Greg Dean Schmitz. "Star Wars Episode III: Revenge of the Sith — Greg's Preview". Yahoo! Movies. Archived from the original on February 19, 2007. Retrieved March 5, 2007. ^ "Star Wars Home Video Timeline: Return of the Jedi". davisdvd.com. Archived from the original on July 10, 2007. Retrieved June 23, 2007. ^ "Star Wars Saga Repacked in Trilogy Sets on DVD". Lucasfilm. StarWars.com. August 28, 2008. Archived from the original on October 26, 2008. Retrieved November 8, 2008. ^ "George Lucas Announces Star Wars on Blu-Ray at Celebration V". Lucasfilm. StarWars.com. August 14, 2010. Archived from the original on August 16, 2010. Retrieved August 15, 2010. ^ Vlessing, Etan (April 6, 2015). "'Star Wars' Movie Franchise Headed to Digital HD". The Hollywood Reporter. Retrieved April 7, 2015. ^ "Return of the Jedi (1983)". Box Office Mojo. Retrieved May 31, 2016. ^ "Star Wars: Episode VI - Return of the Jedi (1983)". Rotten Tomatoes. Fandango. Retrieved April 15, 2019. ^ "Star Wars: Episode VI - Return of the Jedi Reviews". Metacritic. CBS Interactive. Retrieved April 15, 2019. ^ Ebert, Roger (May 25, 1983). "Return of the Jedi". RogerEbert.com. Retrieved March 10, 2007. ^ Kendrick, James. "Star Wars: Episode VI—Return of the Jedi: Special Edition Review of "Return"". Q Network. Archived from the original on February 7, 2008. Retrieved March 10, 2008. ^ "Star Wars III: Return of the Jedi". Time. May 23, 1983. Retrieved March 10, 2007. ^ Clarke, Gerald (May 23, 1983). "Great Galloping Galaxies". Time. Retrieved March 12, 2007. ^ Vincent Canby (May 25, 1983). "Lucas Returns With the 'Jedi'". The New York Times. Retrieved March 10, 2008. ^ James Berardinelli. "Star Wars Episode VI: Return of the Jedi - Reelviews Movie Reviews". Reelviews Movie Reviews. ^ "The best – and worst – movie battle scenes". CNN. March 30, 2007. Archived from the original on April 8, 2007. Retrieved April 1, 2007. ^ Rinzler, J.W. The Making of Star Wars: Return of the Jedi. ^ "The 56th Academy Awards (1984) Nominees and Winners". Academy of Motion Picture Arts and Sciences. Retrieved October 9, 2011. ^ "Awards for Star Wars: Episode VI — Return of the Jedi (1983)". Internet Movie Database. Retrieved March 12, 2007. ^ "AFI's 100 Years ... 100 Movies Nominees" (PDF). Retrieved February 3, 2013. ^ "AFI's 100 Years ... 100 Thrills Nominees" (PDF). Retrieved February 3, 2013. ^ Star Wars, Episode VI — Return of the Jedi (Mass Market Paperback). Amazon.com. ISBN 0345307674. ^ "Return of the Jedi Produced by NPR". HighBridge Audio. Retrieved March 6, 2007. ^ "GCD :: Issue :: Marvel Super Special #27". comics.org. ^ Edwards, Ted (1999). "Adventures in the Comics". The Unauthorized Star Wars Compendium. Little, Brown and Company. p. 87. ISBN 9780316329293. The adaptation of Return of the Jedi was published in Marvel Super Special #27 and in a separate miniseries, once again penciled by Al Williamson and inked by Carlos Garzon. ^ "Star Wars In The UK: Read Along Adventures". Arnold, Alan. Once Upon a Galaxy: A Journal of Making the Empire Strikes Back. Sphere Books, London. 1980. ISBN 978-0-345-29075-5.